“the action or logical operation of negating or making negative”. In simpler terms, negation defines the polar opposition of affirmative, denies the existence or vaguely – a refutation. This is also known as “Not”. Classical logic resembles negation with truth function which takes truth to falsity and is perfectly capable of running the opposite operation. It denies the truth of a sentence. It’s just the conversion of the affirmative sentence which converts the simple affirmative sentence into negative. I like to sing = I do not like to sing. By changing the auxiliary verb of the sentence into negative, we can apply Negation in a sentence. 1. Present Indefinite Tense Do = do not/ don’t, does = does not/doesn’t. 2. Present Continuous Tense Am = am not, is = is not/isn’t, are = are not, aren’t. Some words such as ever, anybody, anyone, anything, anywhere, instead of never, nobody, no one, nothing, nowhere, etc. represent the Negation. I do not think he can ever reach within time. Double negative on the other hand, simply defines the existence of two forms of negation in the same sentence. Please, notice that a double negative can often result in an affirmation in the English language (e.g., He hardly stops for small-talks). The rhetorical term for such a phenomenon is ‘litotes’. I can not find him nowhere. He cannot go nowhere without informing me. Such as ir, un, non, pre, anti, il, im, etc. John is not uncontrollable by his family member though he is a special child. In modern English, Double Negatives are highly avoidable as it is grammatically wrong. We know we cannot use more than one negative word in a statement. It usually used in informal conversation or speech and in songs’ lyrics as well. To form a correct sentence, we must avoid using a double negative in a single sentence formally. 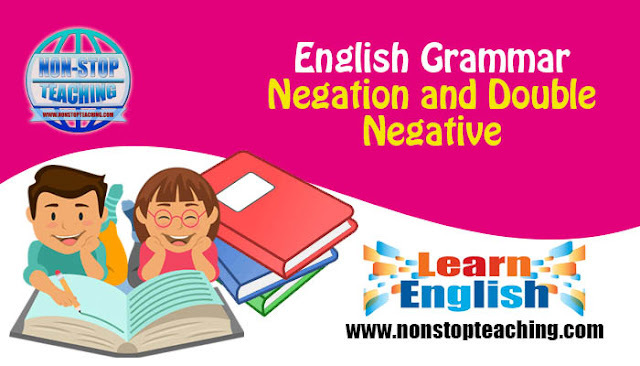 Expains negation and double negative in english grammar with examples.